Hello everyone!!! Oh, how I've missed you! I've been working on some wonderful things! While on my little hiatus, my husband decided I could move all my polish up to our guest room and finally have a place of my own. I have been working on finally having everything organized. I still have a lot to do, so my posts will still be sporadic until I can get everything in order. So, please, bear with me for a bit. Then, I'll be able to get things back to normal and I want to work on trying new things and expanding my nail polish horizons! For now, I have a new collection from LynBDesigns to show you all. 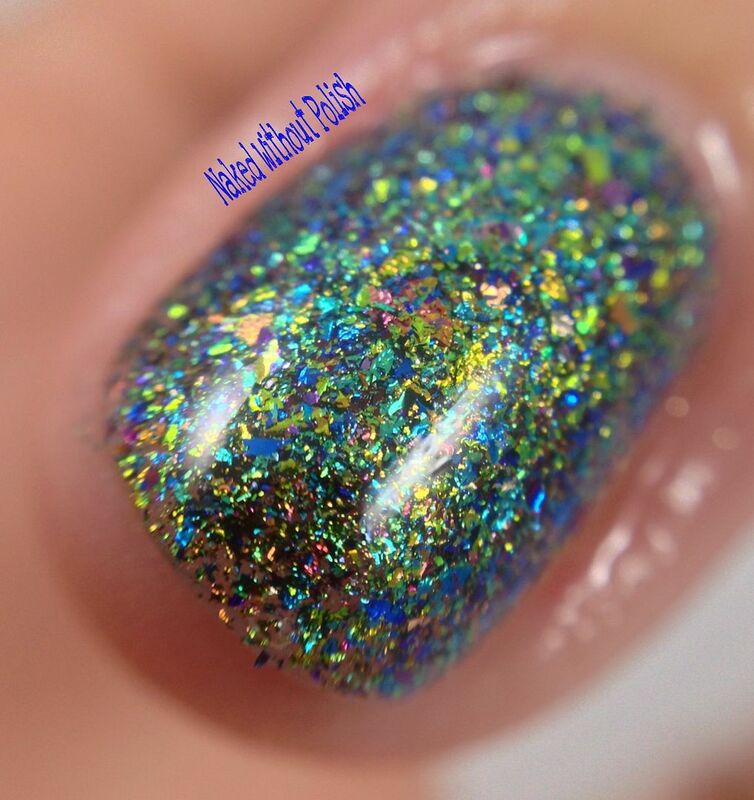 The About A Galaxy Collection is a beautiful twelve piece collection full of flakies!! 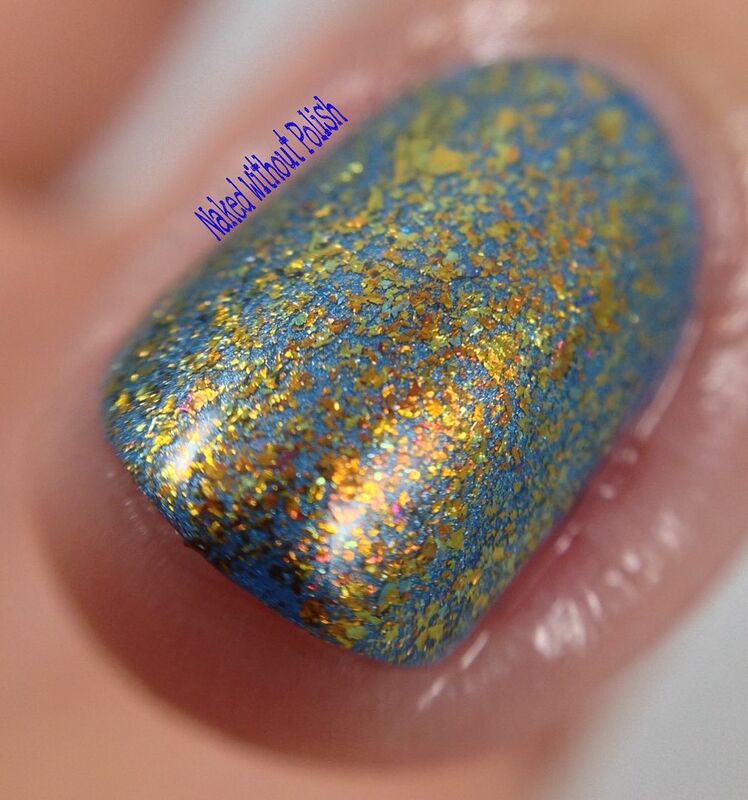 All kinds of flakies!! Ultra chameleon chrom flakes. 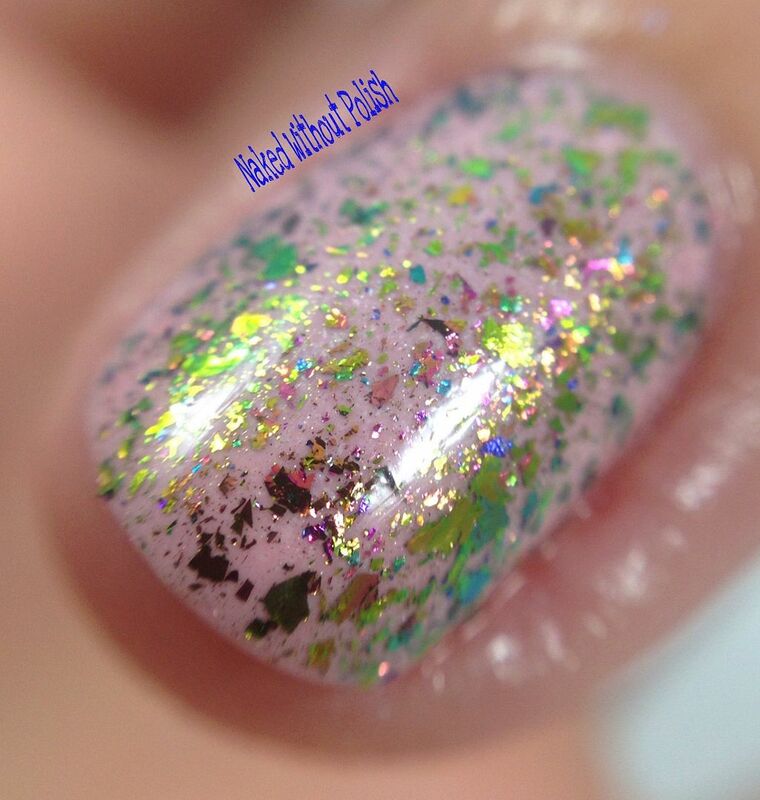 Iridescent fantasy flakies. 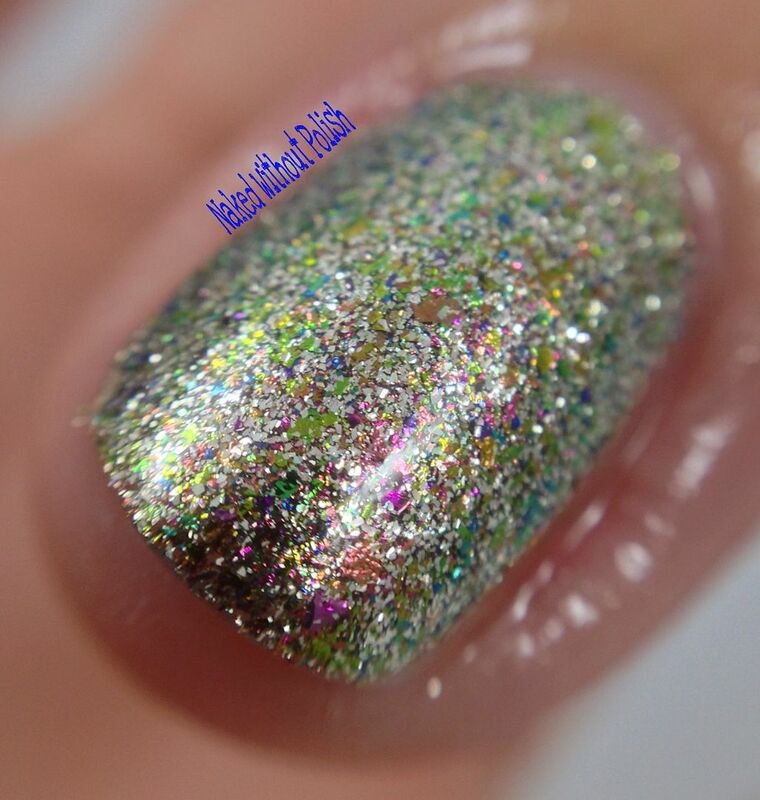 Even some platinum flakies. She drew inspiration from the Galaxy Song from Monty Python's The Meaning of Life. If you're not familiar with the song, watch the video below...please. 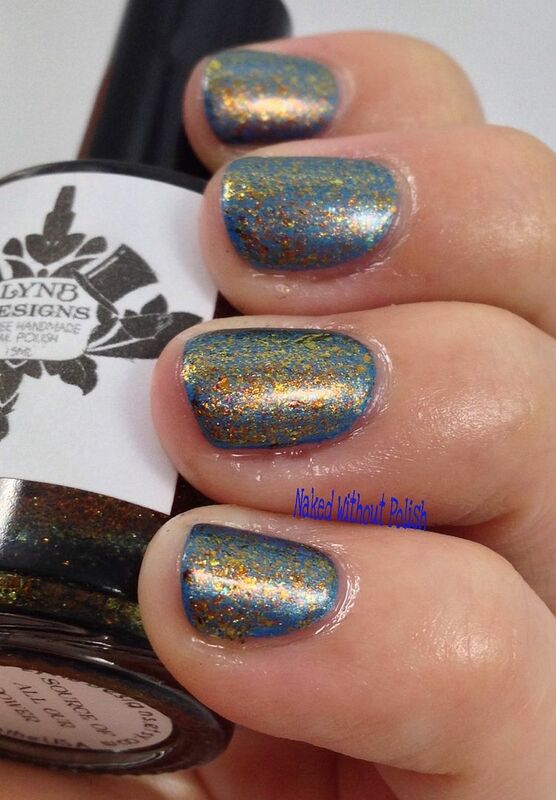 Now that you've seen the inspiration behind the collection, how about some swatches? 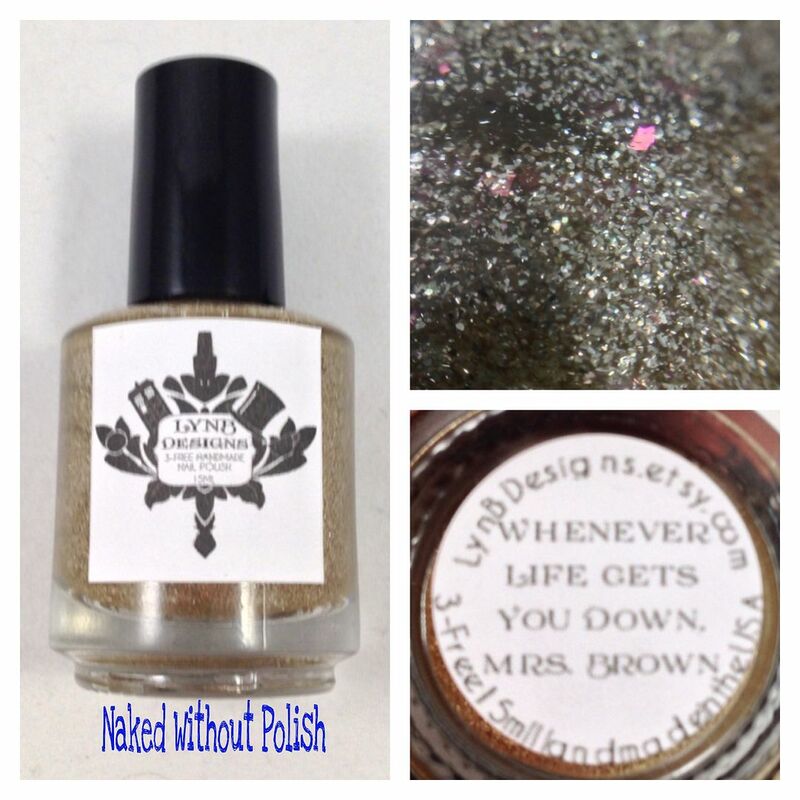 Whenever Life Gets you Down, Mrs. Brown is described as "a tan crelly based polish with micro silver flakies and pink to orange fantasy flakies". Whenever Life Gets You Down, Mrs. Brown has an easy application. After three coats it was pretty opaque on it's own, but one coat is perfect as a topper. 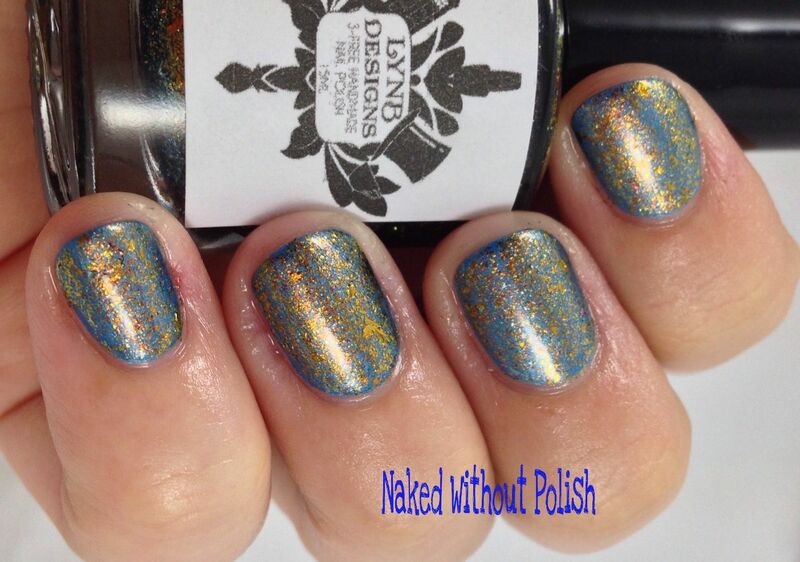 Shown is three coats of Whenever Life Gets You Down, Mrs. Brown. Shown is one coat of Whenever Life Gets You Down, Mrs. Brown over Finger Paints 15 Minutes of Frame. 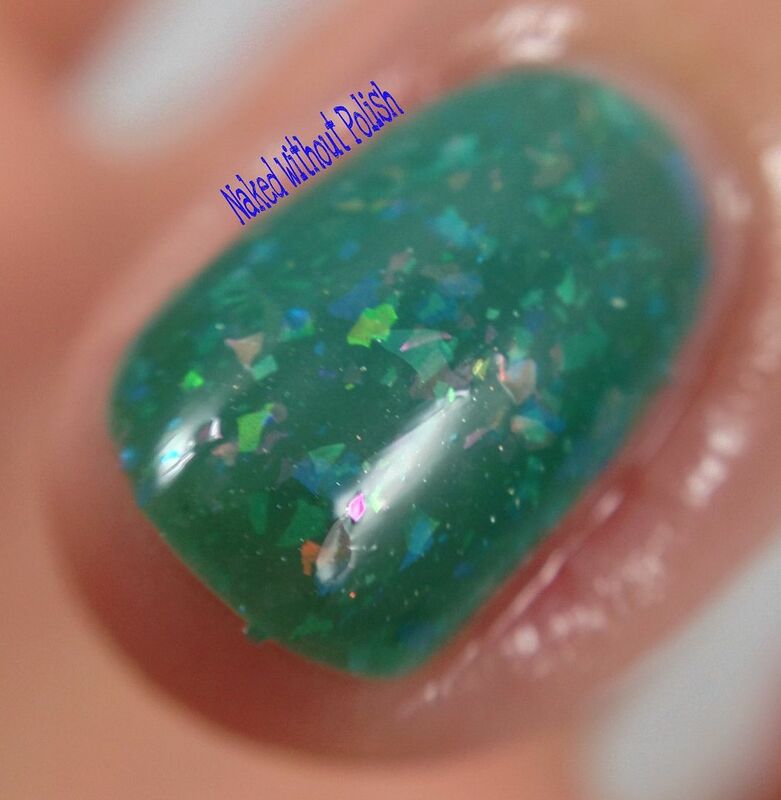 Planet That's Evolving is described as "a blue toned medium green crelly loaded with multi-colored fantasy flakies; dries with a dull finish". 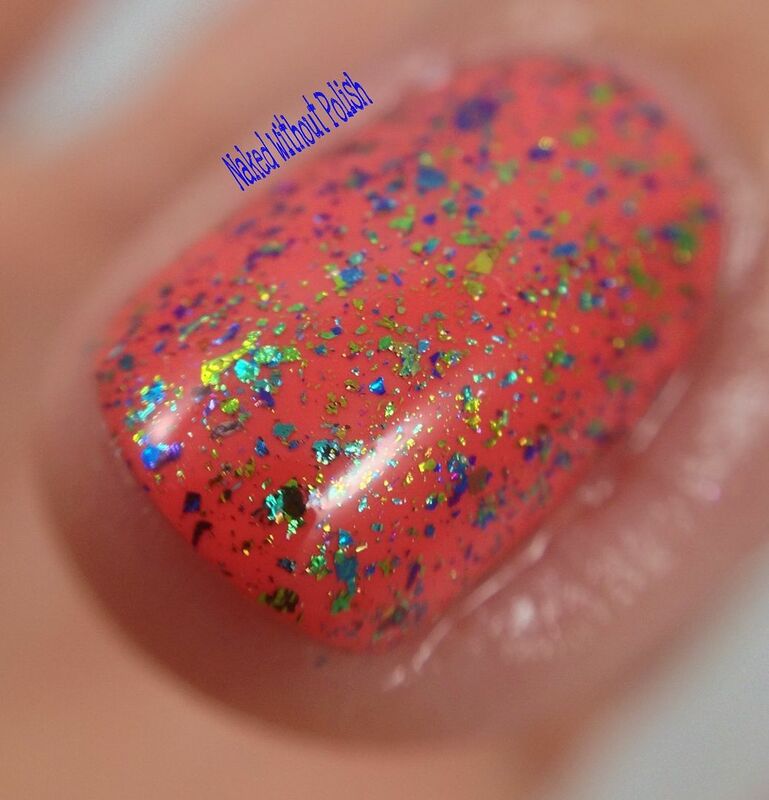 Shown is two coats of Planet That's Evolving. Planet That's Evolving may be a crelly, but it definitely leans more toward a jelly. It's wonderfully squishy!! A perfect application with minimal clean up. 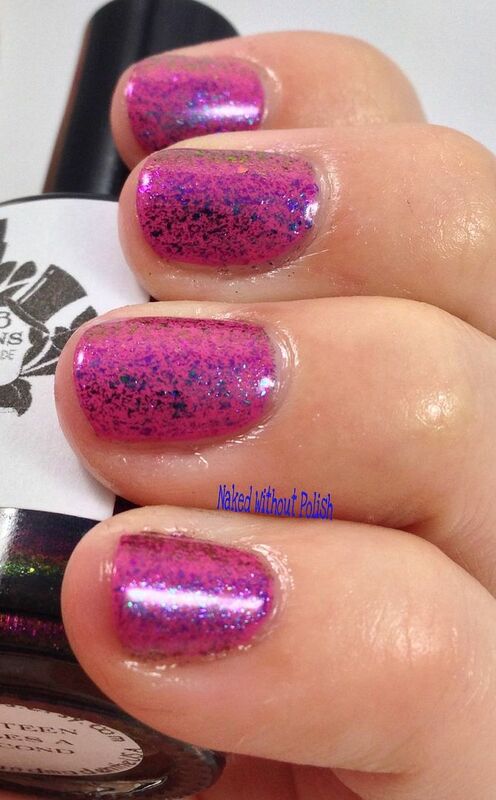 Nineteen Miles a Second is described as "an ultra chameleon chrome flakie topper that shifts from pink to blue to purple to green". Nineteen Miles a Second is stunning both on it's own and as a topper. 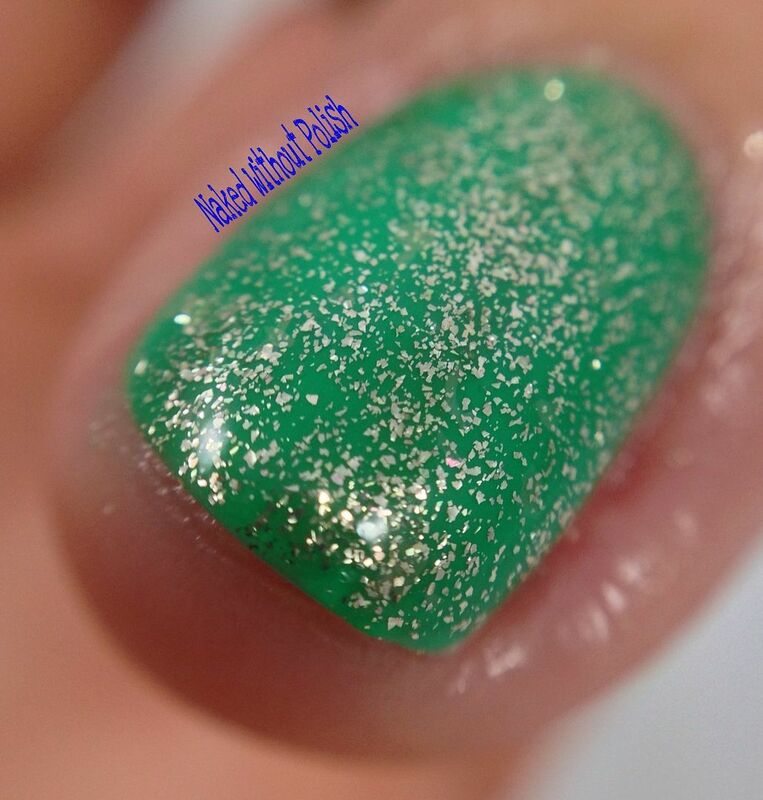 It needed more coats than I'm used to to become opaque, but it's not a thick polish, so you don't mind. No hunting for the shifts in this beauty. It's all up in your face in the best way possible. Shown is four coats of Nineteen Miles a Second. 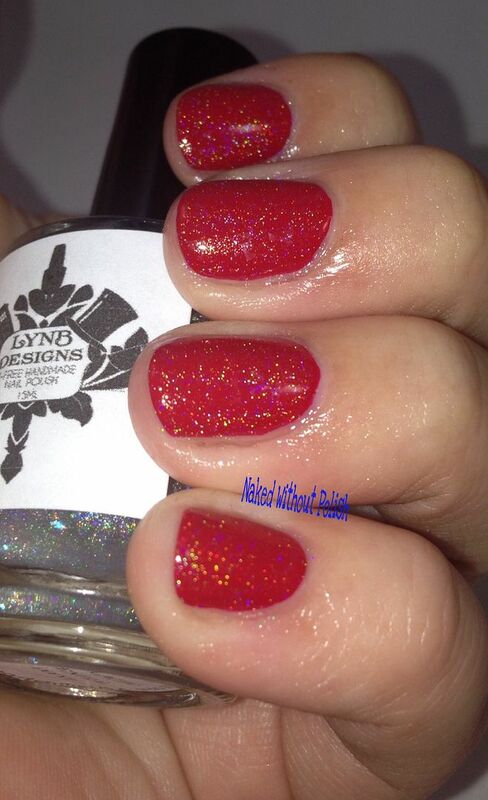 Shown is one coat of Nineteen Miles a Second over OPI Suzi Has a Swede Tooth. Source of All Our Power is described as "an ultra chameleon chrome flakie top coat that has a linear shift from bronze to gold to silver". Source of All Our Power left me speechless. I would stare at it and swirl the bottle. It is mesmerizing. 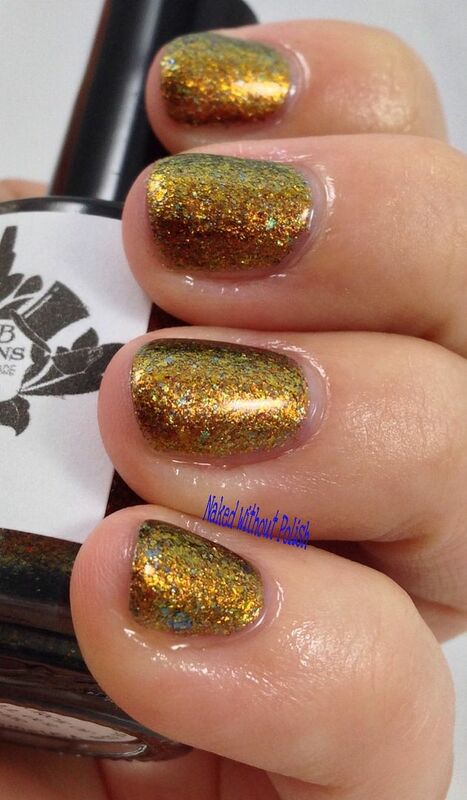 The colors are perfections and it's like autumn in a bottle. 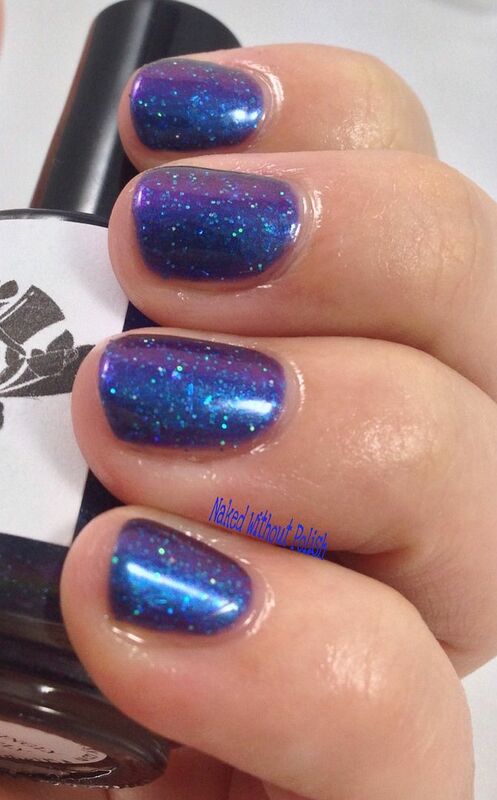 Perfectly opaque in three coats. Shown is three coats of Source of All Our Power. Shown is one coat of Source of All Our Power over OPI Dining Al Frisco. 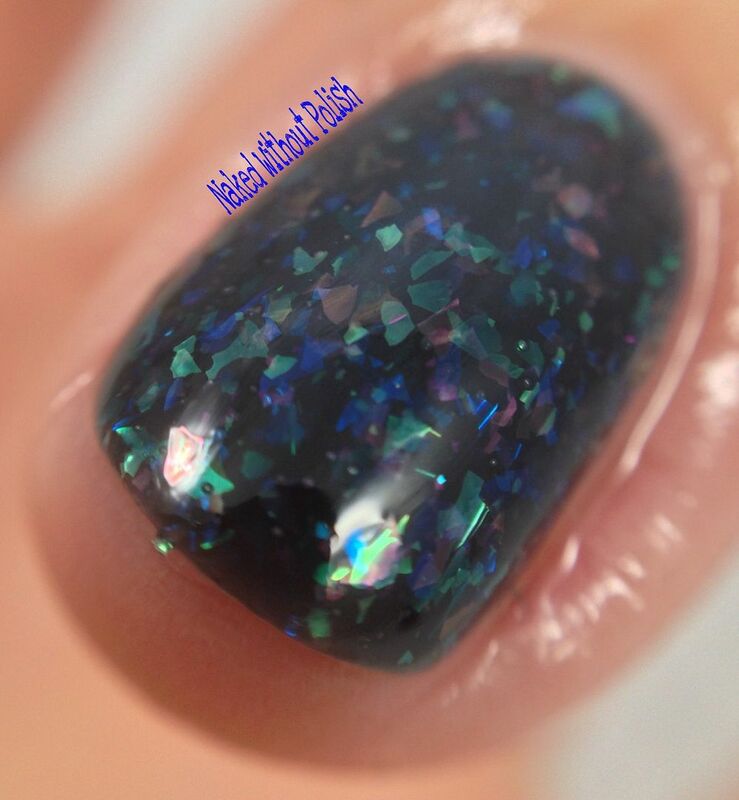 All the Stars That We Can See is described as "a murky blue toned black jelly base loaded with rainbow fantasy flakies". 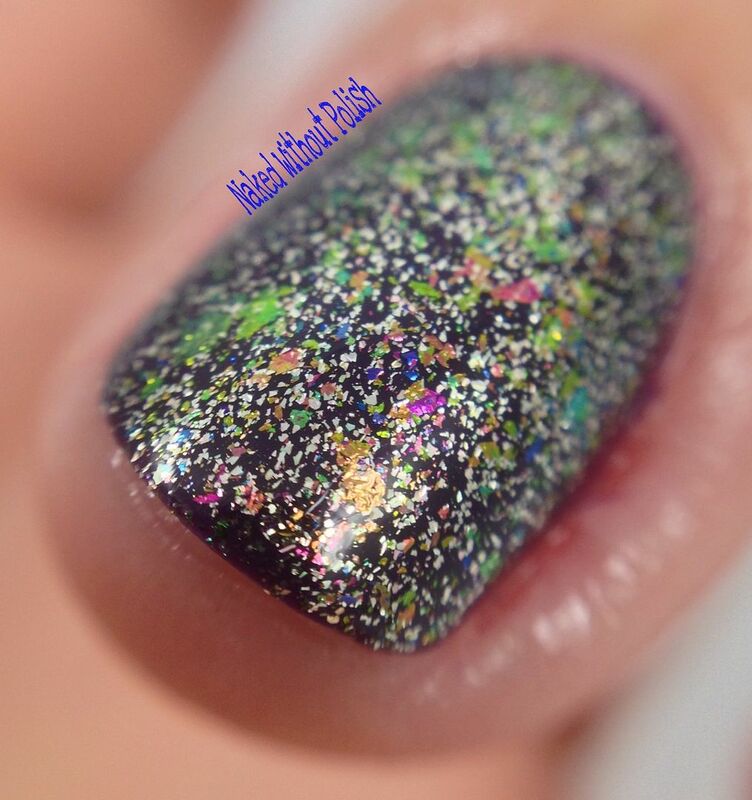 Shown is two coats of All the Stars That We Can See. I had to stop myself at two coat of All the Stars That We Can See. I wanted to keep layering it to get more and more depth. Smooth application and good dry time, can't go wrong with this one. Galaxy We Call the Milky Way is described as "a blurple jelly base loaded with green fantasy flakies that shift to orange and yellow". 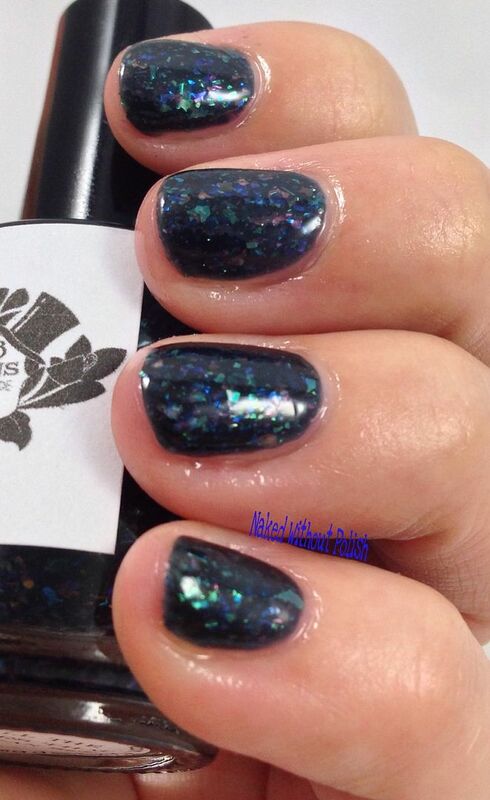 Shown is two coats of Galaxy We Call the Milky Way. Galaxy We Call the Milky Way is one of those polishes you reach for unknowingly. It draws you in and you don't even realize it. It's so simple, yet you can't take your eyes off of it. Just like the other jellies, it's got a perfect application. No staining or issues. 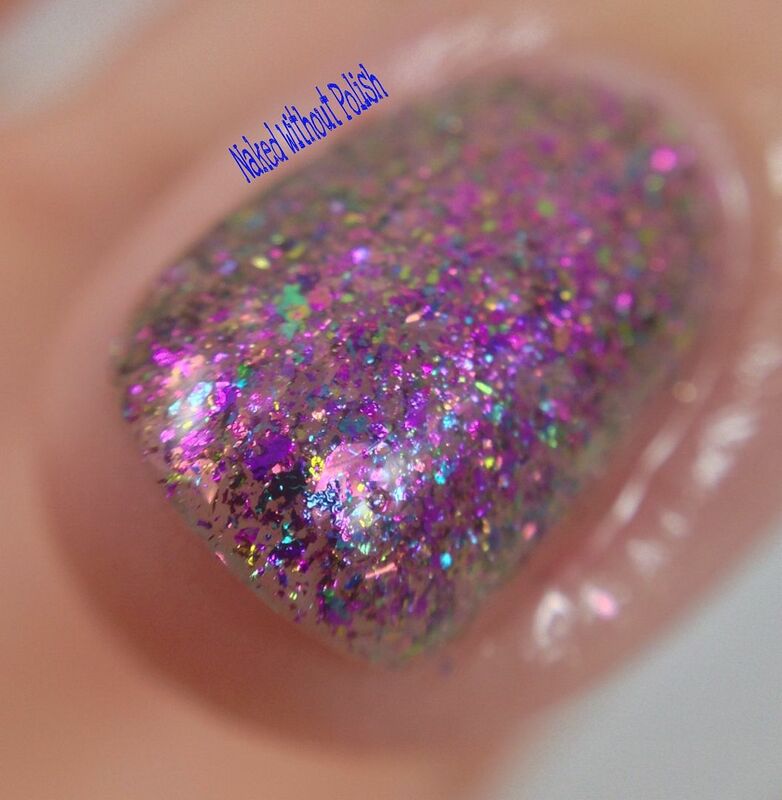 Galactic Central Point is described as "a linear holographic topper with blue to purple fantasy flakeies". 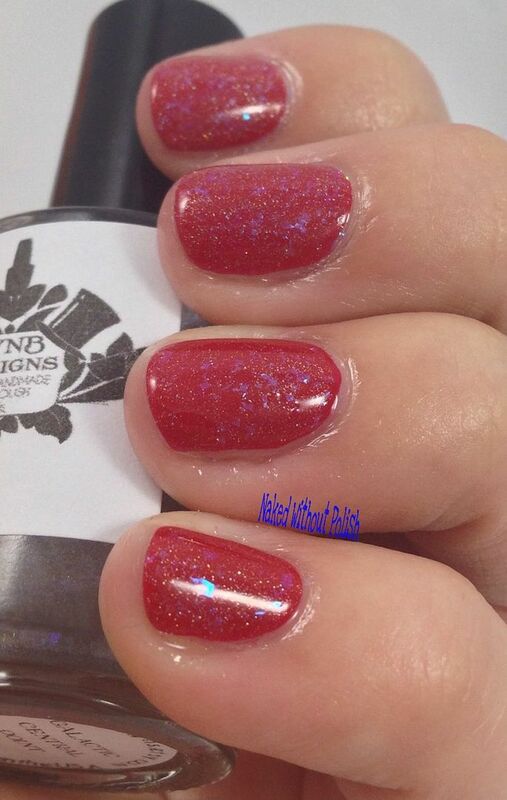 Shown is one coat of Galactic Central Point over Louboutin Rouge. 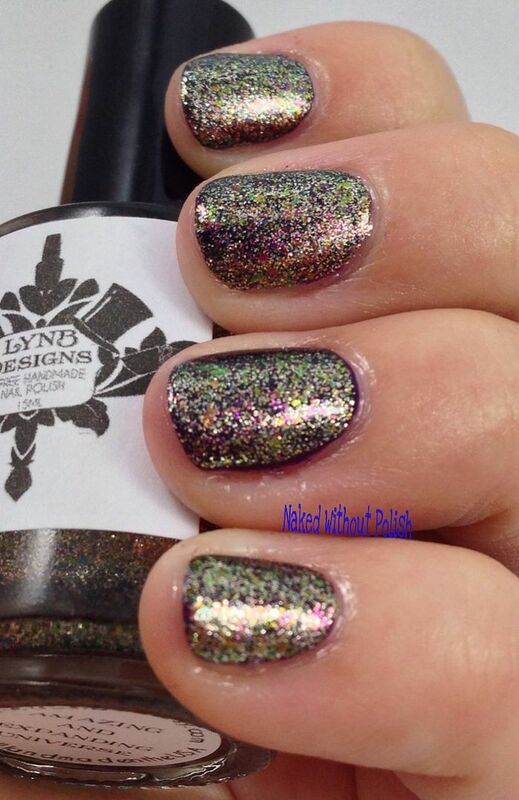 LynBDesigns started the year off right with this collection, but Galactic Central Point steals the show and is already "Topper of the Year" in my books. A little goes a long way and applies beautifully. 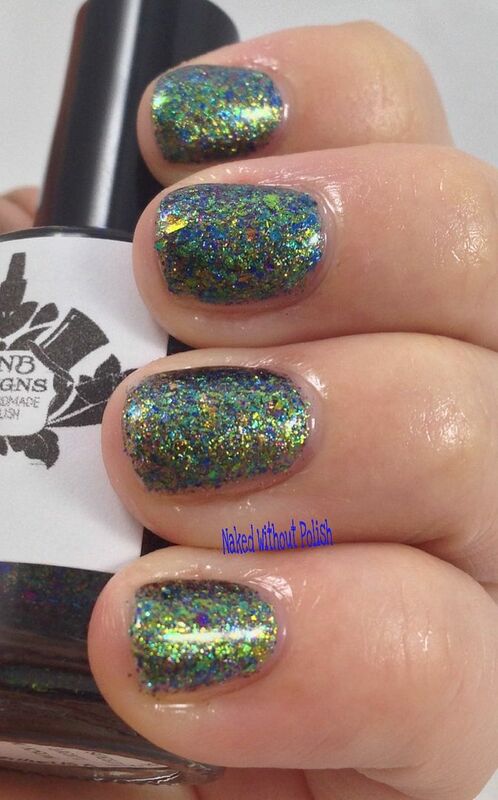 Amazing and Expanding Universe is described as "a clear base with micro silver flakies and ultra chameleon chrome flakies that pepper the silver with tones of green, gold, bronze, and even a bit of red". 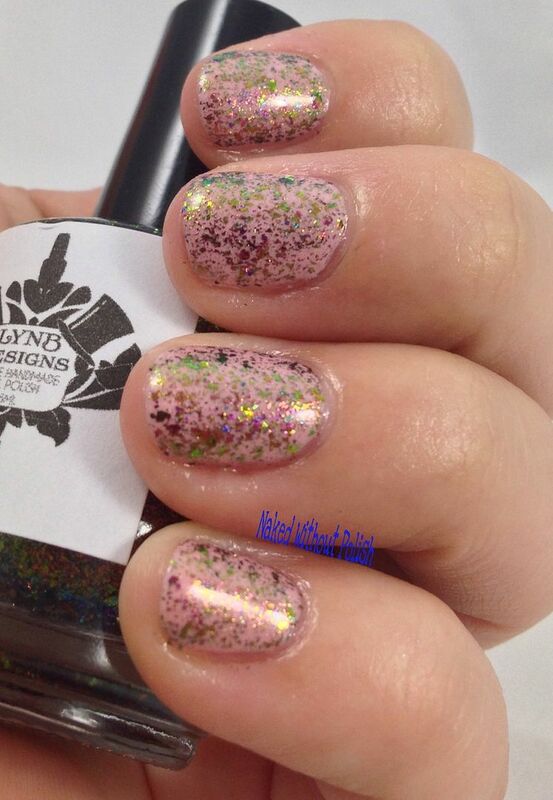 Each of these flakies is more stunning than the last, Amazing and Expanding Universe is no exception. 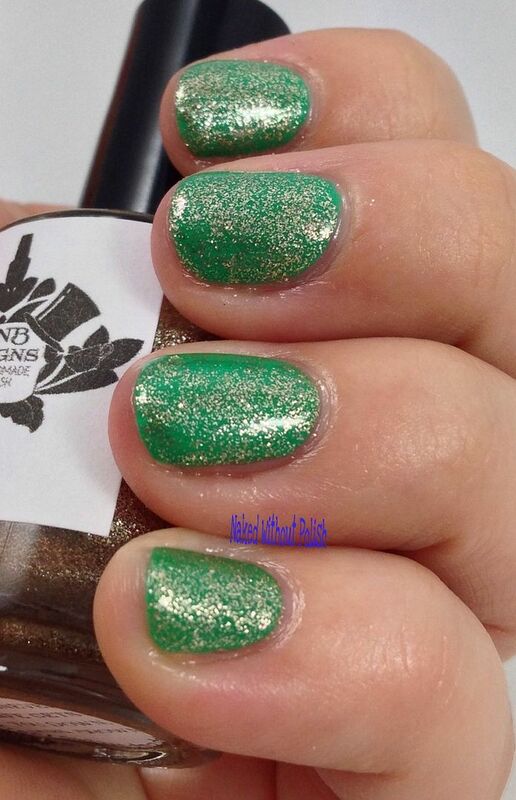 It may be one of the more muted polishes in the collection, but it still packs a big punch. The same wonderful application as the others. 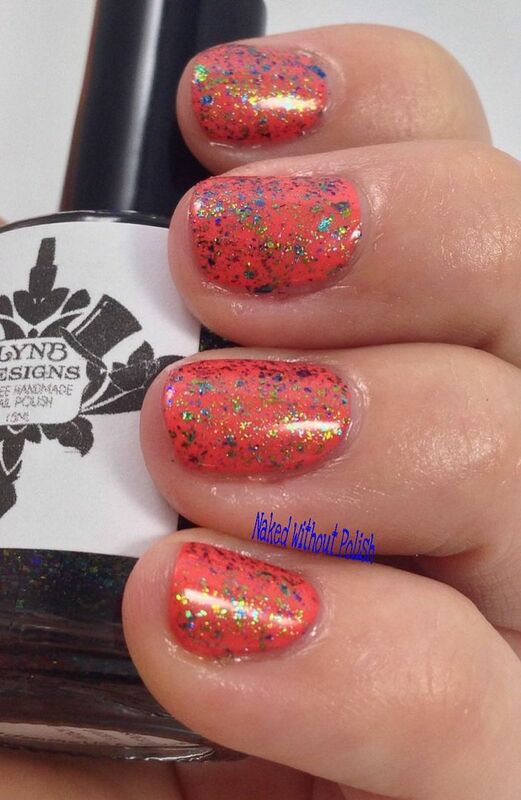 Shown is three coats of Amazing and Expanding Universe. 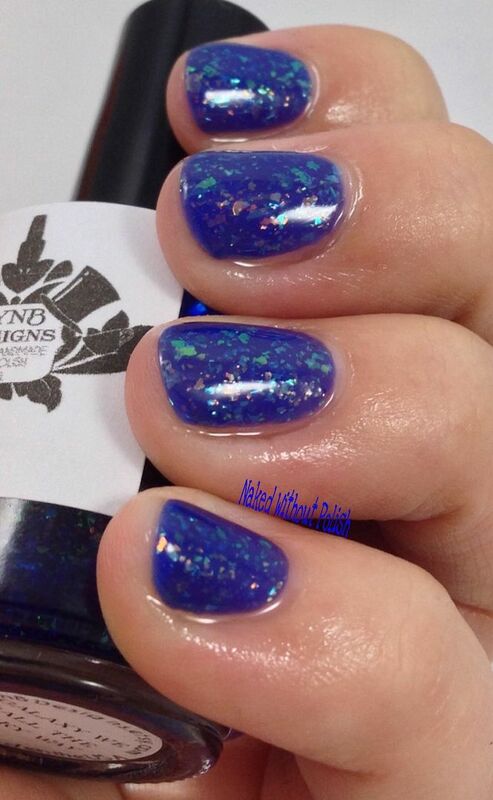 Shown is one coat of Amazing and Expanding Universe over OPI Viking in a Vinter Vonderland. 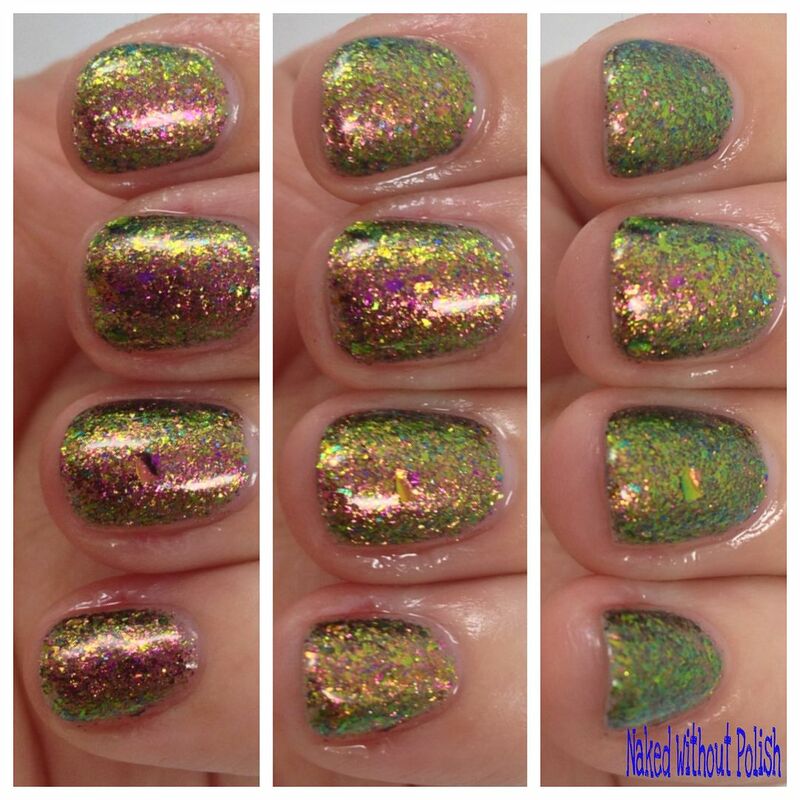 The Speed of Light You Know is described as "an ultra chameleon chrome flakie topper that has a scattered shifting effect that shows blue, green, gold, and even bronze". The Speed of Light You Know is magical! The colors are almost that of a peacock. Jewel toned and mysterious. After four coats, it still wasn't fully opaque. I think I prefer this one as a topper. It's not bad on its own, but I love the way it transforms as a topper. 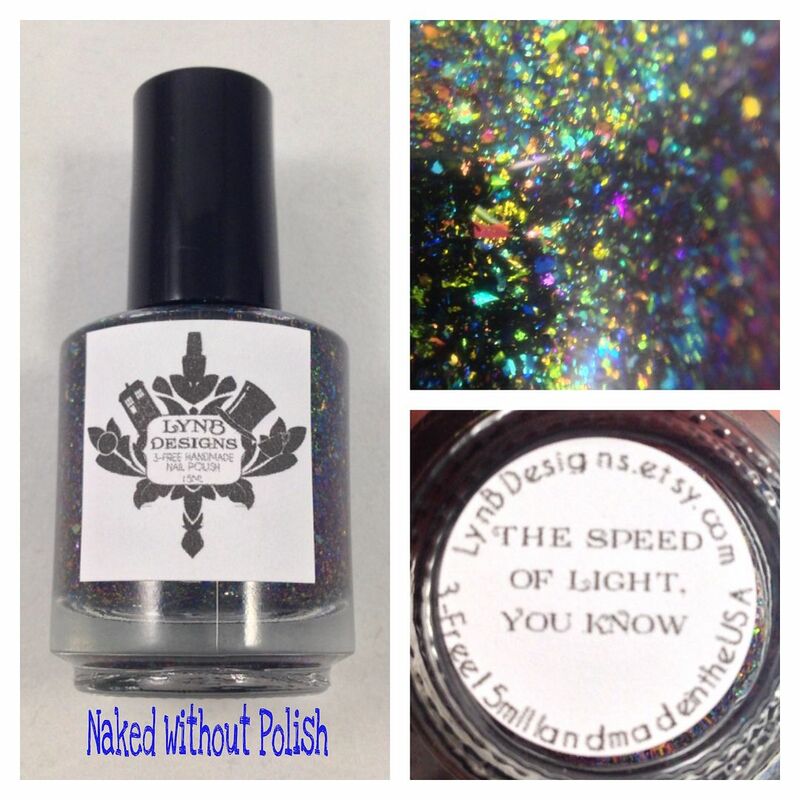 Shown is four coats of The Speed of Light You Know. 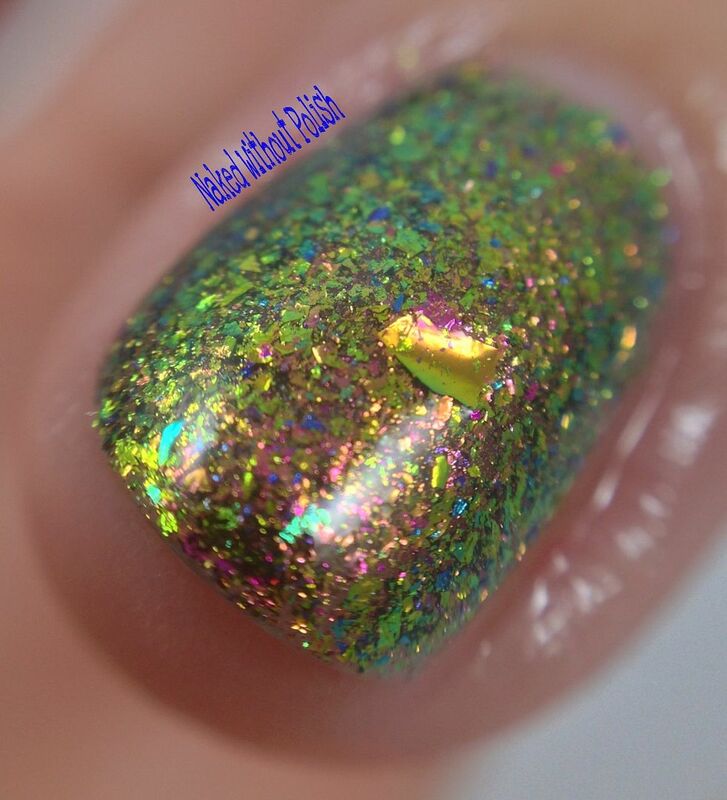 Shown is one coat of The Speed of Light You Know over OPI Can't Afjord Not To. 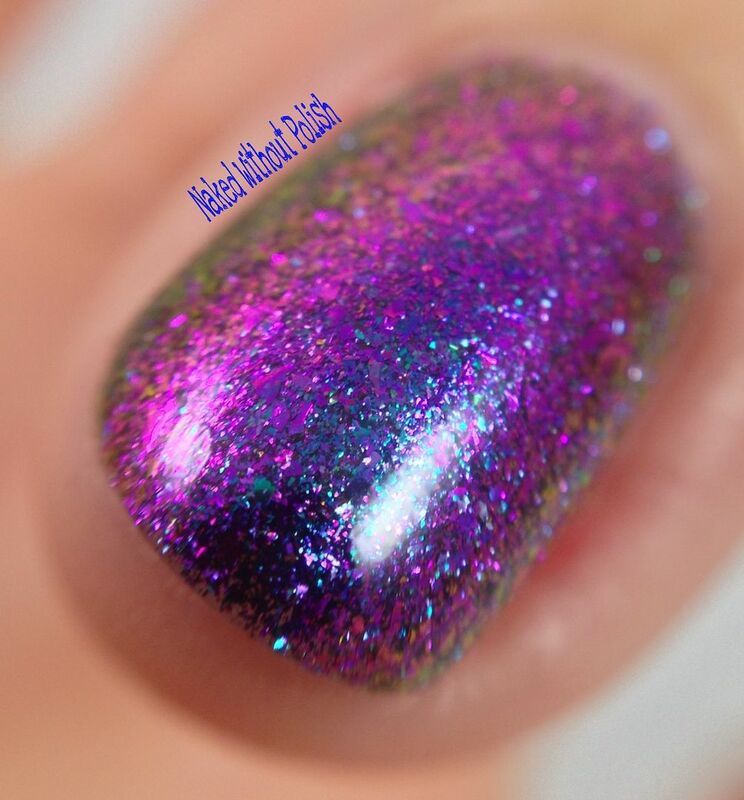 Feeling Very Small and Insecure is described as "an ultra chameleon chrome flakie topper that has flashes of pink, blue, green, and purple as well as pink to purple fantasy flakies". Feeling Very Small and Insecure is another one I prefer as a topper. It wasn't fully opaque after four coats, but as a topper it shines. Shown is four coats of Feeling Very Small and Insecure. 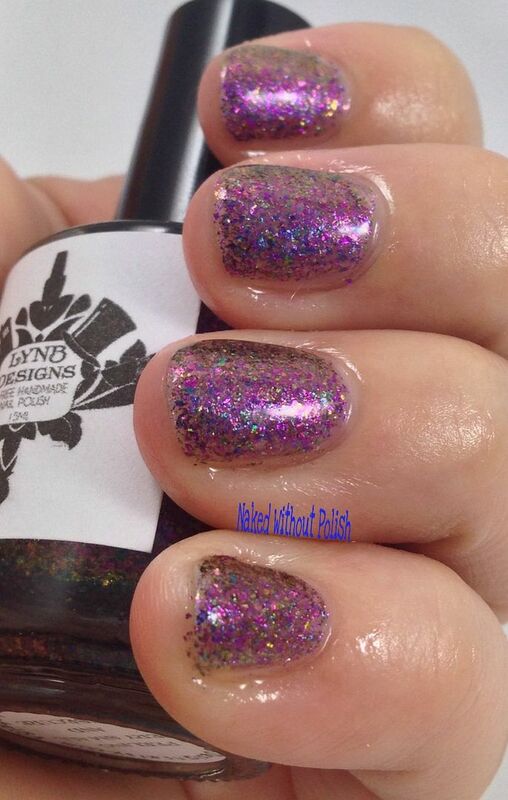 Shown is one coat of Feeling Very Small and Insecure over OPI My Dogsled is a Hybrid. 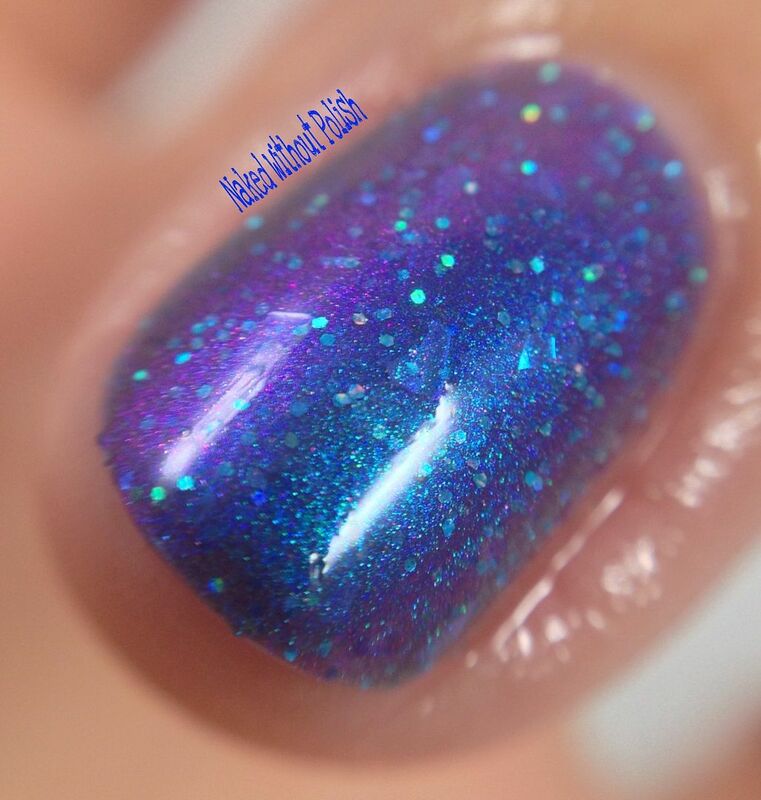 Amazingly Unlikely is described as "a blue based multichrome that shifts from blue to purple to pink and even gold it contains a smattering of aqua holographic glitter and blue fantasy flakies". 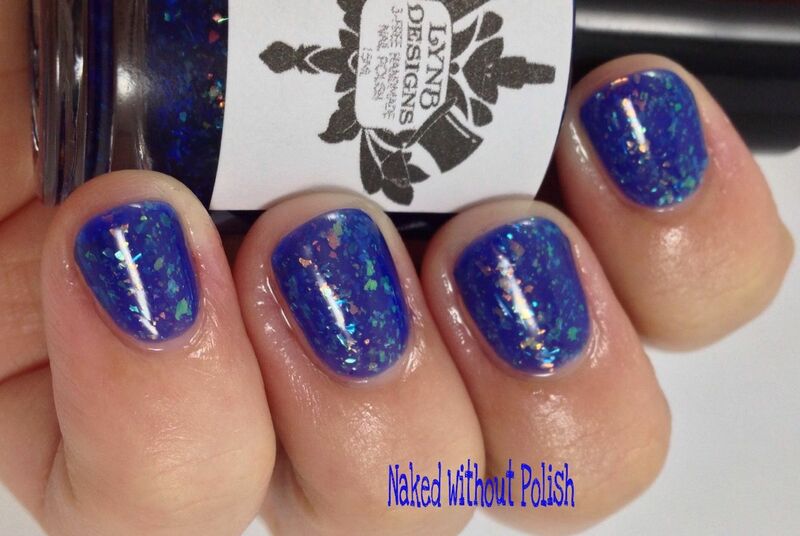 Shown is three coats of Amazingly Unlikely. Amazingly Unlikely is just flat out amazing! It's constantly shifting and is full of so much depth. 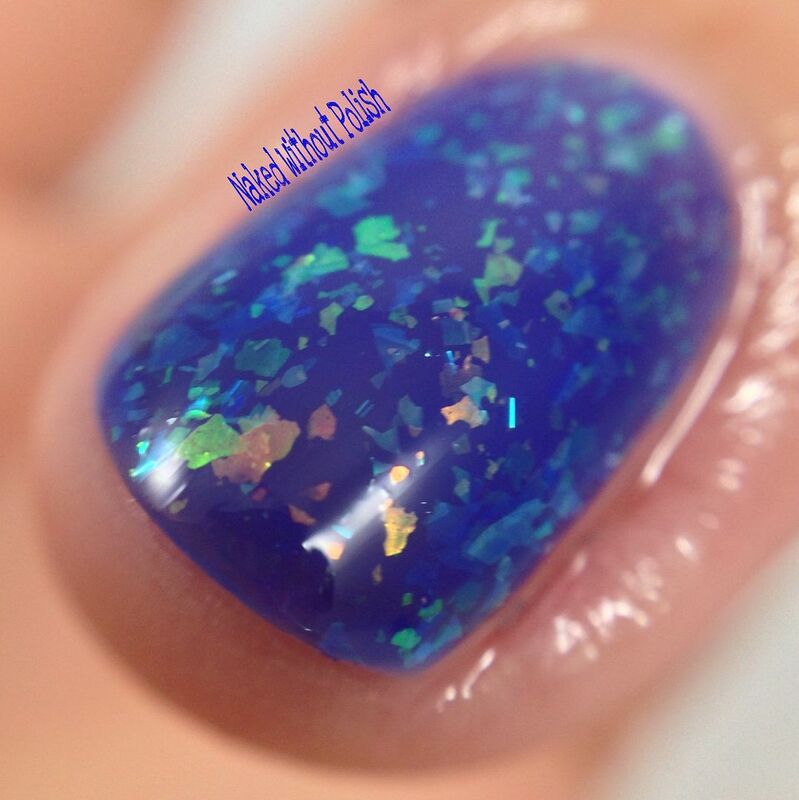 A perfect application and would make a fun base for a galaxy manicure. 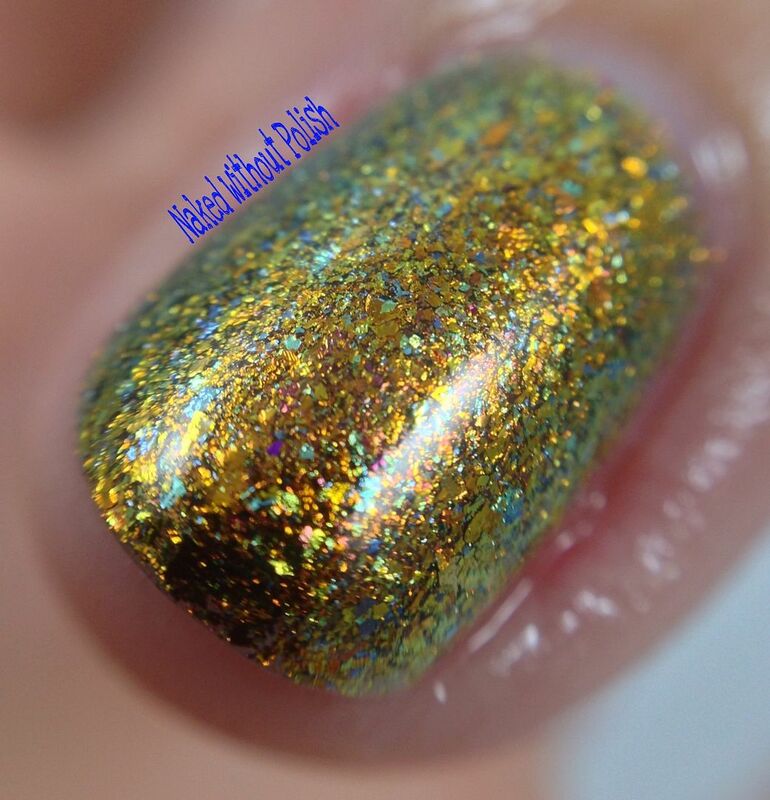 Here on Earth is described as "an ultra chameleon chrome flakie topper that shifts from green to gold to bronze to red in a sort of linear way". Here on Earth has an almost reptilian look about it when used on it's own. 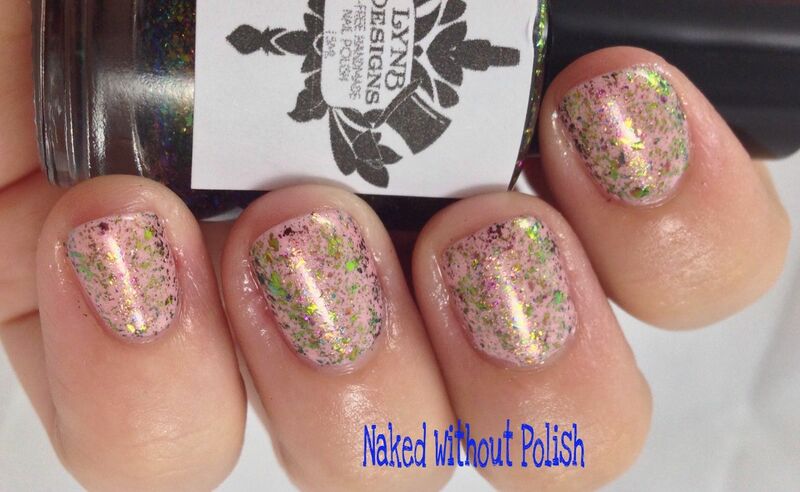 It's full of a natural beauty that you don't see too often in a polish. As a topper, it's like jewelry dancing on your nails. 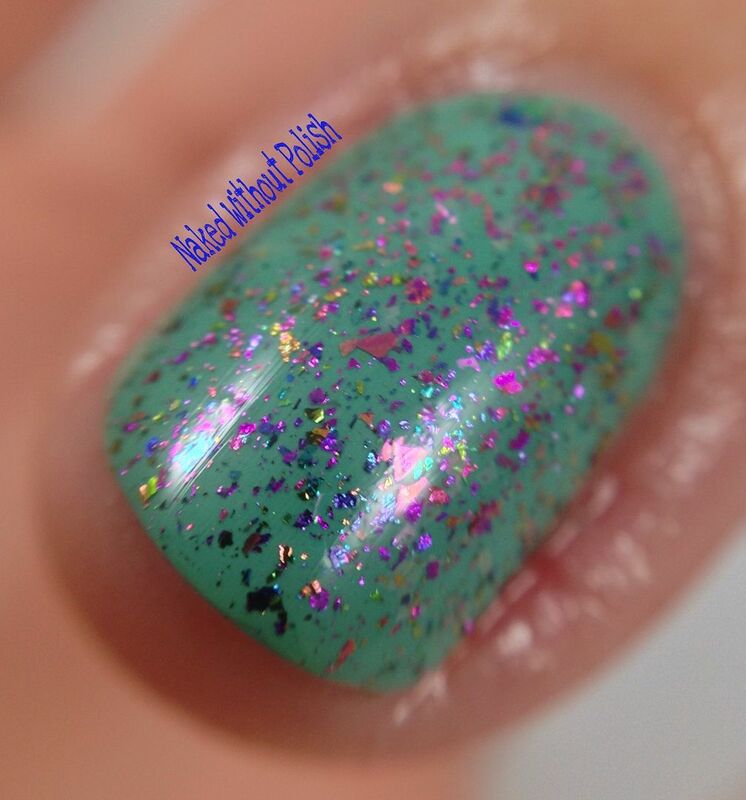 Shown is three coats of Here on Earth. 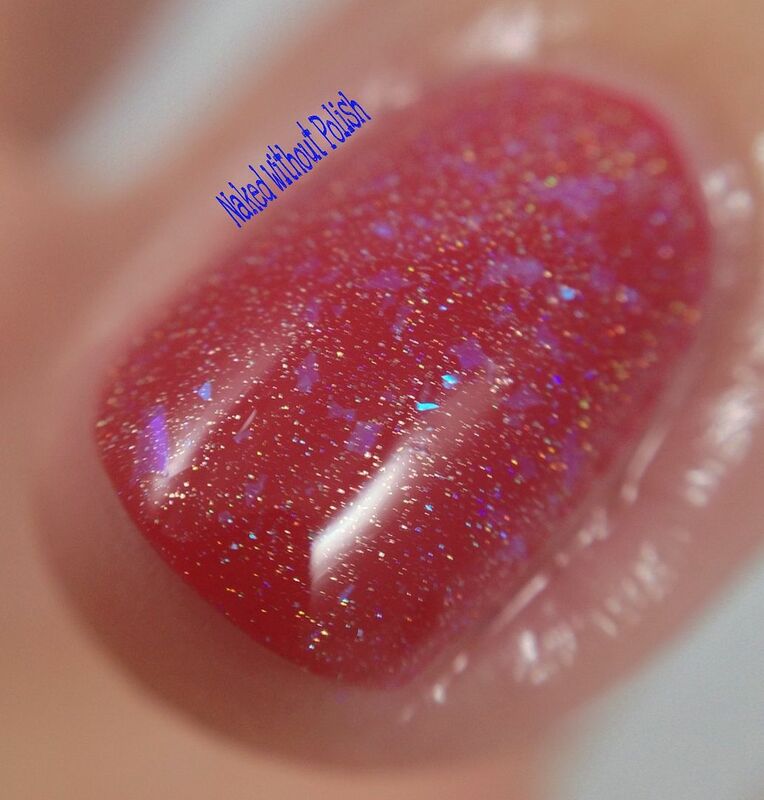 Shown is one coat of Here on Earth over Finger Paints Pink Imagination. 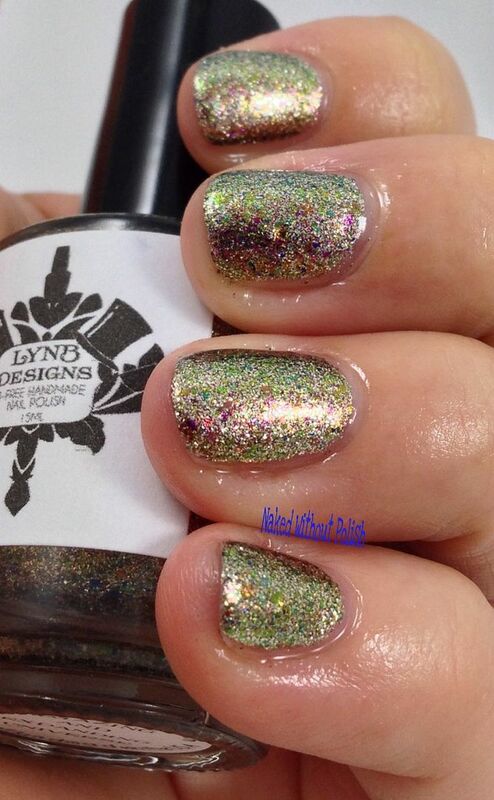 What do you think of the About A Galaxy Collection from LynBDesigns?! 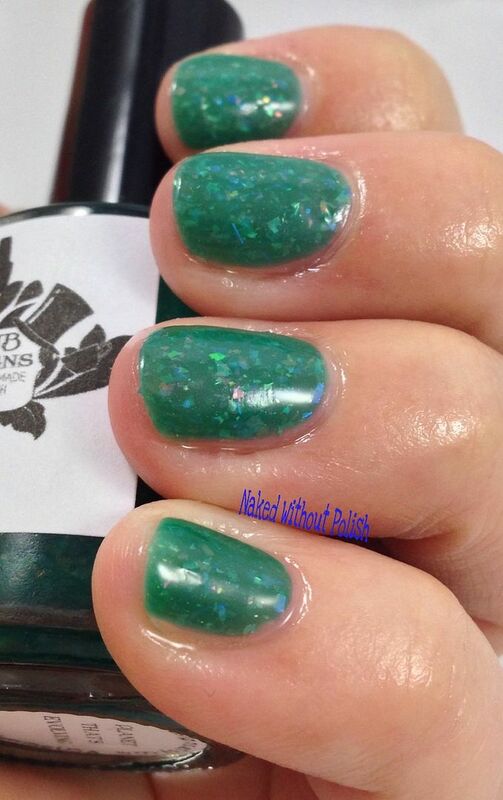 I'm in love with these, and I think she did a lovely job making them so original when everyone is releasing their own version of flakie polishes. 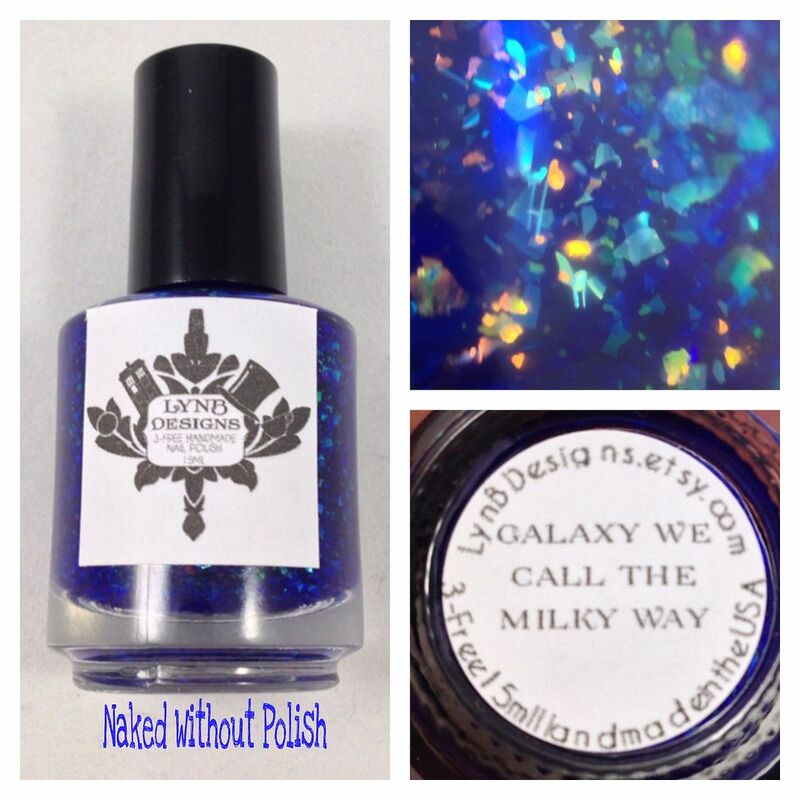 The About A Galaxy Collection will be released at noon on 1/24/2015. Each bottle will be $10. 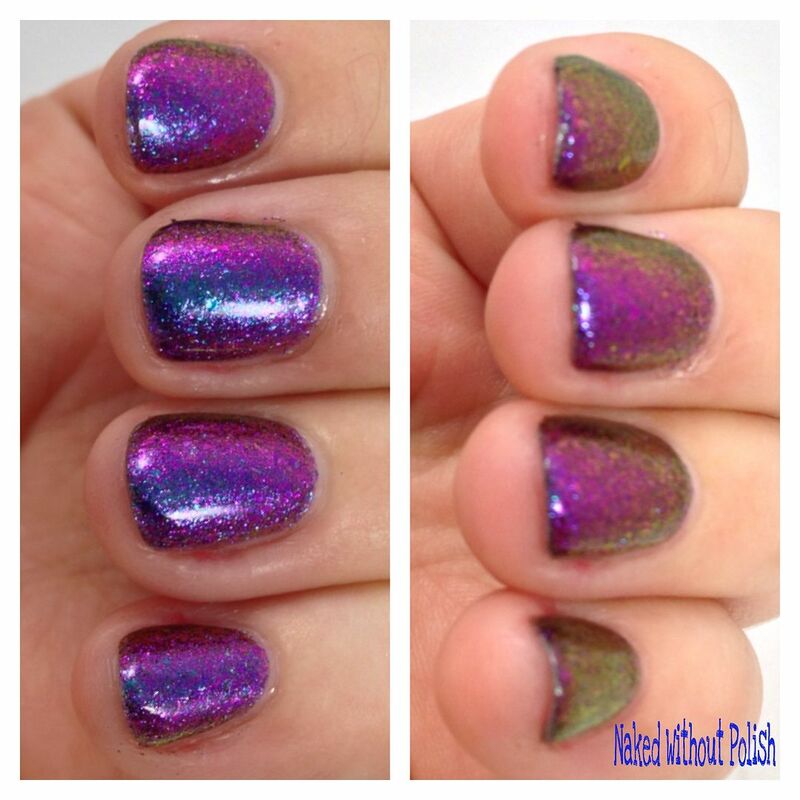 In all of the swatches I used B-Sticky base coat ($6), B-Shiny top coat ($6), and B-Moisturized cuticle oil ($6). Trust me, this is a collection that you're going to want every single one. So unique and versatile. Which ones are calling to you?